The evening was conducted in the usual fashion, with everything tasted blind, but with the tequilas there weren’t as many of us in the room who might know what they were. Even so, we started off with something that was slightly more obvious as to what it was due to it being presented by Stephen. He’s one of the founders of Ilegal Mezcal (which I know a little bit about due to it popping up at a tasting earlier this month at TWE) and was just passing through London for bureaucratic US visa renewal reasons. Matthias heard he was in town and dragged him along, despite jetlag and the general tiredness that comes of being a brand ambassador/company owner who runs around waving his mezcal around while he’s awake. Stephen’s background is a bit of a weird one, coming to Mezcal very much the hard way. While travelling across Guatemala he had his credit card cloned and was taken for about $10,000, leaving him very much without cash and knocking around in a foreign country. He got a job at Café No Sé in La Antigua, a rather excellent looking dive bar, and started getting into Mezcal, now one of the bars selling points (to the extent that one part is exclusively reserved for the selling of it, with customers having to go to the other end of the building if they want anything else). 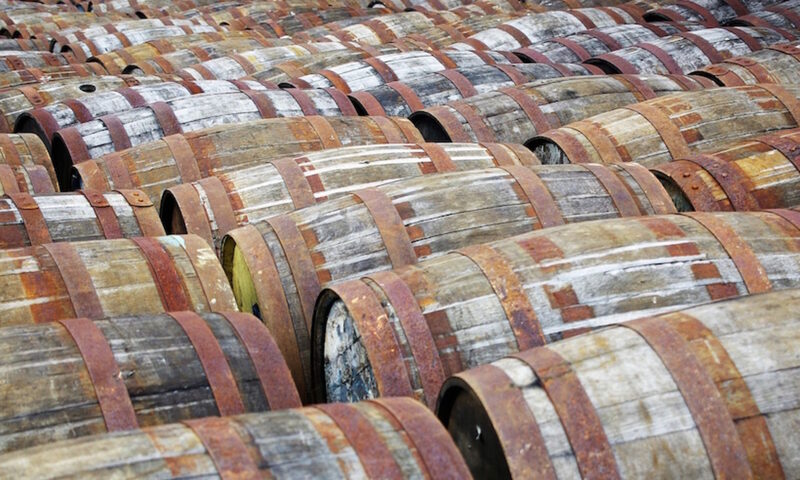 In order to get the good mezcal they were after, which was illegal to export, they engaged in a classic South American pursuit – booze smuggling. They’d drive the 1000km to Oaxaca, load up on juice from the various farms and estates in the area, strap tanks of the stuff to the bottom of the van and then drive back to Guatemala, handing over bribes and driving nonchalantly as appropriate. Eventually after enough close scrapes, brushes with organised crime and other stories that Stephen will happily relate with a worried look in his eye they went legit, hooking up with the experienced distillers at Destileria Tlacolula to produce Ilegal, named for the levels of legality of their previous mezcal importing ‘experiments’. Mezcal is made in a similar manner to tequila (which I’ve gone about at quite some length in the past), differing generally in a few details – which agave plants they use, how they prepare them and how big the distilleries are. Firstly is the agave itself, which for tequila can only be one variety – the blue agave. Mezcal has recently started becoming more regulated (with some outcry over the latest proposals from the Mexican government which would hurt mezcal production due to further restrictions) and there are about 30 types of agave that can be used to produce it. The most popular of these is Espardin, used in Ilegal, although the range of plants used is huge leading to a respective range of flavours. Next is the preparation of the agave, which needs to be cooked before being crushed and fermented. In tequila production large ovens or, in more recent times, autoclaves are used to cook the piña without much impact from the fuel used to fire the oven. However, for mezcal the traditional method is to dig a pit, fill it with burning wood and then stack agave on top of the ashes before burying the lot for a couple of days. This imparts a lot more smokiness to the agave, leading to one of the distinctive flavours of mezcal – smoke. The third point is the size of mezcal production – it is tiny in comparison to tequila. While small tequila producers are small you’ll often find that the small mezcal producers really are operating out of a shed at the back of their house. It’s not as big a seller as tequila yet, with many mezcals still being available in tiny amounts outside of Mexico, but even so the number of tiny stills and bucket sized fermentation vessels is impressive. I suspect there’s a bit of marketing BS in there, but mezcal is still very much an artisinal spirit. Ilegal stick at the mezcal factory end of things – ie. a small farmyard with a bottling plant that has recently been upgraded to have a foot pedal rather than a tap to fill each bottle. They use wild yeasts rather than adding anything to the mash, crush the agave with a horse-drawn tahona and dilute down from 53% abv (the level it comes off the still) using a local aquifer. Fairly industrialised for the mezcal world, but still very low-key and artisinal compared to most other spirits. Anyways, onto the first drink of the night – poured without us being told what it was, but fairly obviously something from the Ilegal stable. On the nose it had rubber, iodine, medicinal smoke, crushed stones, butterscotch sweetness and a hint of lime. To taste it was sweet, grappa-like and quite hollow, with light smoke, tingly spice, light black and white pepper, menthol, green peppers, general vegetal notes and a hint of menthol. It finished with sweet fruit and more black and white pepper. It was quickly revealed to be Ilegal Joven, their unaged mezcal, joven being the mezcal equivalent of blanco/plata. It’s not available in the UK yet but it should be around later in the summer. Mezcal pimpage done Stephen stepped back and let Matthias take the floor and take us back to tequila. 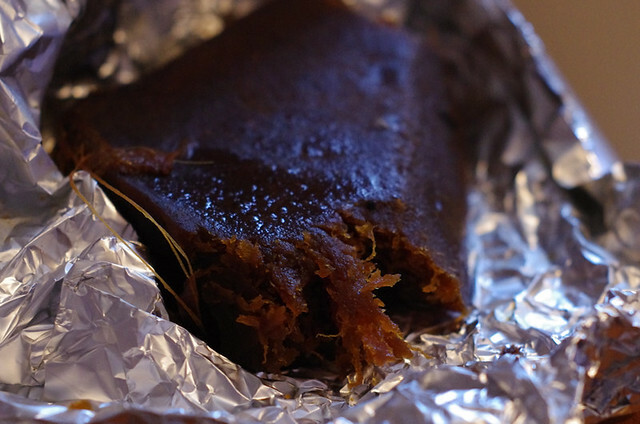 He started by handing around a brick of cooked agave heart, the base ingredient for making tequila – a squidgy and moist lump that had a similar texture to the middle of a fig roll, but without quite so much sugary stickiness. It tasted similar, but with a lot less dark fruit and more juiciness. We then moved on to our second drink of the night, another clear spirit with a sweet fruity nose with white pepper, apples, green chilli and a touch of nail varnish remover (pear drops?). On the palate it was sweet and oily with vegetal green peppers, red pepper sweetness, olive oil, more white pepper and some lemon zest. It finished with some warming peppery spice, apple skin, sour green veg and a hint of minerality. This was revealed to be Olmeca Altos Plata, a 100% agave tequila (unlike the company’s regular mixto tequila which uses non-agave sugars to bulk out the spirit) that appeared in 2009. Matthias is an ambassador for Olmeca, so I was expecting at least one of their tequilas make an appearance, and this was a nice fruity plata with restrained pepperiness. We then moved on to our first añejo tequila of the evening, more heavily coloured and very dry on the nose, with meaty smoke, dry wood, lots of minerality and a hint of pine. To taste it was oily and much sweeter than the nose suggested, with a classic pepper and fruity agave flavour. It finished hot and spicy with lingering agave. 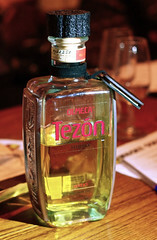 This was revealed to be Tézon Añejo, another entry in the Olmeca stable. Named for the tezontle tahona that they use to crush the cooked agave, it is aged for 18 months in ex-bourbon casks, a bit longer than the year minimum and much less than the 3 years maximum to be still called añejo, giving it a bit of woody flavour without overpowering the underlying spirit. Last of the night was something that we could quickly tell was a bit special. On the nose it had dark chocolate, mint, green beans, pine, cucumber and a bit of damp forest cognac-like rancio. To taste it was rich with a chocolate liqueur-like sweetness backed up by caramel, black pepper and Cadbury’s Whole Nut, finishing with more chocolate and chilli spice. Quite an impressive tequila and unlike any I’ve tried before. The paper came off to reveal that this was Don Julio 1942, a very limited edition tequila which is now onto its third iteration. This was the second version (the one that comes in a green box), not quite as good as the long sold out first version but a big step up from the latest edition. The distillery was founded in 1942 by Don Julio González-Frausto Estrada when he was 17, and after a lifetime spent distilling he pretty much invented the concept of premium tequila with the Don Julio range. The 1942 was released in 2002 to celebrate the 60th anniversary of the distillery and contains tequilas aged up to about 20 years – much longer than the 3 years that’s the minimum for extra Añejo tequilas and even longer than the 10 years used for the oldest ones that I’ve tried so far. Unfortunately Don Julio died about a month ago, but the remaining bottles of 1942 are a fitting legacy. And that’s that. A successful foray into the world of non-tequila with an impressive number of sceptical people converted to the joys of agave through the course of the evening. Big thanks are due to Stephen, for giving up even more sleep to come along, Matthias, for generally being rather excellent and also letting me pinch the remaining cooked agave for ‘experimentation’ at home, and to Andy to choosing the right person to pester in the darkness of Wahaca last March.